I'm not really a whisky drinker, but I do like cooking with it and I think it's terrific with chocolate and caramel based desserts. I was intrigued by this recipe for Bowmore Salted Caramel Crust I was asked to try using Bowmore Small Batch single malt Scotch whisky. Created for Bowmore by Mark Sargeant (owner of Rocksalt in Kent), this drink is sweet, salty and smooth, with the Bowmore Small Batch bringing flavours of peat smoke, salt, citrus and vanilla. Bowmore Small Batch has been exclusively matured in first and second-fill ex-bourbon casks to create an earthy smokiness that Bowmore single malts are famous for. The caramel that you make for the crust is gorgeous, I'm thinking I could use it as a filling for some chocolates or to pour over ice cream, and I'm definitely pinching the caramel crust idea! This would be a great alternative to leave out for Santa, who's probably going to be a bit fed up with milk and cookies by the time he gets to my house! 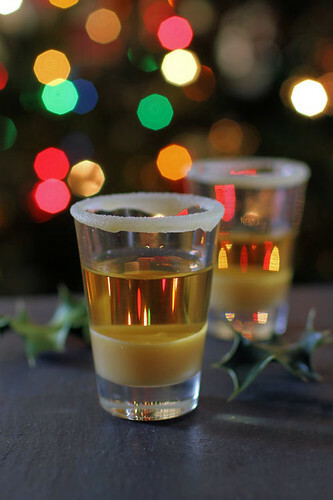 This recipe makes a fair amount of the caramel, I would make half or a third for next time if just using for the rims of glasses, and to pour a little in the bottom of the glasses - although left-over caramel is no bad thing! 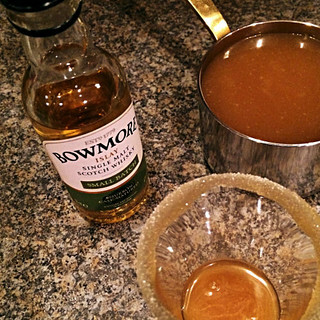 Recipe from Mark Sargeant for Bowmore. Melt the butter, sugars and syrup in a small pan and simmer for three minutes. Add the cream, whisky and sea salt then simmer for another minute or two until it thickens. 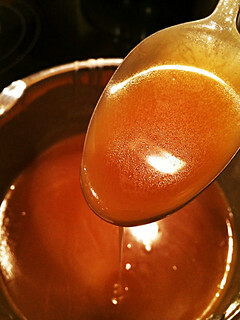 Cool the caramel, pour onto a small plate, dip the glass rim into it and then into some fine caster sugar. Spoon a small amount of sauce into the bottom of the glass and then chill in the fridge for at least an hour. Pour Bowmore Small Batch into the glass and enjoy. You can find Bowmore on Facebook and Twitter, and you can see a video of Mark Sargeant making the Bowmore Salted Caramel Crust here. Disclosure: I was sent some samples of Bowmore Small Batch to make the drink, I was not required to write about it. All views are my own. I love the idea of having a whisky crunch.. great recipe. I haven't tried Bowmore, and only recently got into whisky, and now really like some of the single malts from scotland, discovering more and more...!